Partnership Agreement for the implementation of the Project titled WASTEMAN was signed on 29.10.2018r. between Project Leader Instytut Maszyn Przepływowych im. Roberta Szewalskiego Polskiej Akademii Nauk and „EKO DOLINA” Ltd.
C) Enabling sustainable value aspects. The first output is a Design Manual for co-design of ISWM systems which supports the building of design strategies in cooperation with the municipal stakeholders of the South Baltic area. The second output is a comprehensive package of innovative User Applications for integrated, sustainable recycling of municipal waste fractions. The User Applications represents user oriented innovative solutions, integrating the value chain of collection, treatment and utilization of waste resources. The third output is a Management Toolbox which comprises management guidelines and casestories, which represents a framework for implemetation and dissemination of the ISWM model. 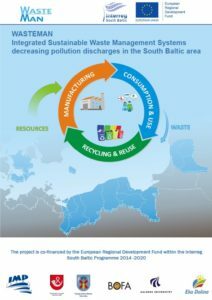 The complete ISWM systems will be produced in a cross border cooperation ensuring a circular change in the South Baltic area. The technology and management system exchange provides added value from the Partners through the cross-border cooperation. The total eligible budget of the Project amounts 1 511 550 euro and cofinancing of European Regional Development Fund Interreg South Baltic Programme is 1 228 636 euro.